Sichuan Province is one of the largest provinces in China with an area of 485,000 km² (187,260 mi²). Its terrain slopes from west to east on the whole and the main landforms include plains, hills, mountains and plateaus. The climate here is mild with plenty of rainfall. The average annual temperature is 14℃-19℃ and the annual rainfall is 900-1,200 millimeters. Located in southwest part of the country, it has been the gateway to Tibet. In fact, the western part of the province is one of the Tibetan-inhabited areas and visitors can experience customs and living habits of the Tibetan nationality here too. Another main ethnic group of the province is the Yi nationality, concentrating in western part of the province as well. Its capital city, Chengdu, is the cultural and industrial center for the agricultural Chengdu Plain and one of the first centers of printing in the country. It has also been famous for its luxurious satins, brocades, and lacquer ware since the 13th century. Apart from the main landforms like plains, hills, mountains and plateaus, Sichuan enjoys a wide variety of beautiful landscapes including ravines, basin, rivers, lakes, hot springs, waterfalls and limestone caves, etc. 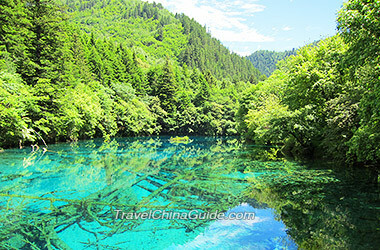 Some of them have been developed into scenic sites for tourism like the Jiuzhaigou Scenic Area and Trumpet Shell Valley. Moreover, the diversified landscapes together with the nice climate nurse a great number of rare plant and animal species. The Hengduan Mountains in its west is home to over one fifth of the country's rare plant species, including the so-called 'Living Fossil', silver fir and sequoia. 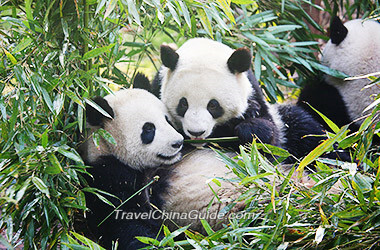 The mountains also host more than 50 kinds of rare animals, among which the giant pandas are most precious. Actually, 85% of China's giant pandas are living in this mountain area, earning the province a reputation of 'Hometown of Giant Pandas'. Visitors can contact with those lovely pandas in Chengdu Panda Breeding and Research Center (one of the most important centers in the world for the captive conservation of giant pandas), Bifeng Gorge Base of China Panda Protection and Research Center, etc. Sichuan is one of the birthplaces of the Chinese nation and plays an important role in China's history. As early as two million years ago, human beings had already begun activities in this area; about 25,000 years ago, civilizations appeared here and formed the highly developed ancient Shu civilization, represented by Three-Star Piles site (Sanxingdui). With the unification of China by Emperor Qin Shi Huang in 221 BC, the region gradually blended the Central Plain culture. Meanwhile, the local culture continued to develop. Up to now, the province could be divided into four culture zones: Ba Culture Zone, Shu Culture Zone, Panzhihua-Xichang Culture Zone and West Sichuan Plateau Culture Zone. During the Three Kingdoms Period (220 - 280), Chengdu had been the capital of the Kingdom of Shu. The long history of early-developed civilization has left this area abundant historical heritages, such as Dujiangyan Irrigation Project, Leshan Giant Buddha and Mt. Emei as well as distinctive local highlights like Sichuan Opera and the delicious local food. Sichuan Opera is one of the most famous operas in the country. Changing faces and spitting fire are the most attractive and mysterious skills of it. Sichuan food is also well-known all over the country and even in foreign countries. It is characterized by spicy and pungent flavors. Typical menu items are: Hot Pot, Smoked Duck, Kung Pao Chicken, Twice-Cooked Pork and Ma Po Tofu. I have plan to visit Yading National park on October. Can I reserved bus ticket? You can reserve the bus ticket about 10 days in advance on the official website of SC Provincial Bus Ticketing System. The hotline is 4008583030. Bus from Dujiangyan to Danba, is it possible without heading back to Chengdu? I'm in Dujiangyan and wanting to head to Danba in a couple days. I cannot however find any information about doing so without returning to Chengdu? Hi there. I know the bus from Dujiangyan to Xiaojin passes Danba. At Dujiangyan Passenger Transport Center, only one bus is scheduled daily for Xiaojin, leaving at 09:00. You may catch it and ask the driver to drop you off at Danban. The fare is CNY88 to Xiaojin and can be cheaper to Danba. This is exactly what we did. Though bus now ends a train xiaojin. A car ride at 30 yuan per person to Danba can easily be found. Thank you! ps. I'm only traveller so i don't need comfort. I can go to more then one place in one day if time is enough. Even if is December are they nice? Thanks for your answer!! Can I ask u if do u know the price to ski in the mountain? Dear Cami, you can go skiing at Xiling Snow Mountain. The fare is CNY 120 per hour, CNY 200 for two hours, CNY 270 for three hours, CNY 320 for four hours, CNY 400 for a whole day. Have fun there! Can anyone tell me if it's possible to get between Emei, Leshan, Bifengxia and Huanglong by bus or train without coming back to Chengdu between each place? I don't mind which order I visit them in. Also can anyone recommend a hotel in or near the Bifengxia panda centre? You may arrange your itinerary this way: Leshan- Emeishan- Bifengxia- Huanglong. To Leshan, take a bullet train to Emeishan from Leshan Railway Station (about 15 minutes). Upon arrival, take bus line 5a to Baoguo Temple. To Bifengxia, take a bus to Ya'an from Jiuzhu Bus Station. The buses are available from 8:10 to 17:20, and the fare is CNY 45. Upon arrival, take a bus to Bifengxia. To Huanglong, take a bus back to Ya'an. Next, take a bus to Dujiangyan from Ximen Bus Station. The buses depart at 9:00, 12:10, and 13:50, and the fare is CNY 41 or 45. Then, take a bus to Songpan from Dujiangpan Passenger Transport Center. The bus departs at 7:00, and the fare is CNY 94. Upon arrival, charter a car to Huanglong for about CNY 200.